India has been the victim of divisive-sectarian violence from more than a century, more particularly after the British implemented their policy of ‘divide and rule’ and encouraged communal formations to flourish. These communal formations, Muslim and Hindu both, in turn spread hatred against the ‘other religious community’ and violence in the name of religion came to be a tragic part of our nation. Many innocents have lost their lives in this violence, which is instrument in the hands of communal forces. As the violence started becoming more structural some features emerged. These features though they have been changing their form from riot to riot, still they have some commonality. The major pattern of riots after independence have been documented and analysed by scholars like Asghar Ali Engineer, Paul Brass, Ashutosh Varshney and others. The inquiry commission reports which have gone on to investigate these acts of carnage have also pointed out to findings that are very disturbing to the plural character of our nation. These findings also show the nature of our political class, administration and police in particular in very poor light. In post independence India, since the Jabalpur riot of 1961 down to the scattered acts of violence in recent years in Rajasthan, (Sarada: Gopalgarh) and many places in UP, the pattern broadly conforms to a well orchestrated mechanism and the failure of the state to control it. The foundation of this violence is in the myths and stereotypes prevalent about the minorities in particular. ‘Social common sense’ prevalent in the society, including that of those who are in charge of controlling the riots is practically the same. This social common sense sees Muslims as criminals, terrorists, anti-nationals and violent people. Earlier, in communal violence two religious communities used to be pitted against each other but lately the minorities are the targeted communities. This ‘social common sense’ perceive the Christians as those who are converting by force, fraud or allurement. The religion wise break up of percentage violence victims is very painful observation, the percentage of Muslims amongst riot victims is close to 90% (their population as per the census of 2001 is 13.4%) The type of attitude taken by police is by and large stereotypical and regards them as the trouble makers and police believes that they can bring these Muslims to heels through bullets and batons. 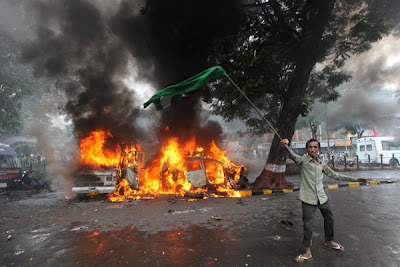 The recent riot in Mumbai 12th August, 2012, does not fit into any of the prevalent notions of riot so far. It is a total contrast to all this and at times also shows the ray of hope about the possibility of positive forces being awakened to quell the violence. The 12th August event was a huge melee of Muslims brought into Azad Maidan of Mumbai by Raza Academy and some other Muslim organizations. Some mobilization was done through the announcement in mosques. Police and organizers say they expected only couple of thousands to turn up, as such 50000 people turned up. Those who came were already feeling the heat of the present anti Muslim violence-displacement of Muslims in Assam and Myanmar. The ground of mobilization was prepared by section of Urdu media, which projected as if Muslims are being attacked all over. This exaggerated sense of insecurity was planted in the minds of large section of community which turned up in large numbers. To add salt to the wounds some speakers made inflammatory speeches and some morphed pictures/posters were shown to the assembled crowd, which felt incited by the whole thing. The real trouble, highly condemnable, began not due to this crowd, but due to other 500-1000 armed Muslims, who started attacking police personnel, molesting women police officers and attacking the OB vans of the news channels. This was provoked due to speakers at the rally aggressively putting forward that media is not showing the news of Assam and Myanmar. Also police was targeted as the Muslim community does have the experience of police having gross anti minority stance. This is so far as the violence conformed to the usual pattern. The things which happened later were a total departure from the past riots. Let’s note that the attack of section of Muslims was not directed against the Hindu community as such. They were targeting media and police. In the first contrast to the usual pattern, the police commissioner, Arup Patnaik, who had seen the 92-93 violence, had different ideas and in the major departure from the attitude of police. Patnaik asked police to exercise restraint. So far the attitude in such situation is a reckless firing, above the waist, to instil a fear factor to control the violence. Patnaik not only asked the police to exercise restraint, he went up to the stage with great courage and conviction and appealed to the crowd to maintain peace, else it may be the repeat of 92-93 carnage. The crowd assembled in the maidan quietly left from the other end of the ground. While the section of Muslims who had come prepared for doing violence, were brought under control with a minimum of bloodshed, 2 dead, over 50 injured. No words can adequately praise the leadership of Mr Patnaik and the restraint shown by the police personnel, despite provocations of the worst order. In this violence police has been the major victim of violence. On the top of this the usual reckless arrests of Muslims in the wake of such a violence has been a bit muted as the instructions seem to be that only those youth-Muslims should be arrested who are seen doing violence in the videos taken at the occasion. This one good use of modern technology is very welcome. One knows that not only in the communal violence but also in the acts of terror, done by which so ever group, it has been the Muslim youth who are arrested in large numbers. The only hope this time around is that the police should be discriminatory enough to arrest only the guilty. The other heartening feature of the episode was the role of Mohalla committees, which has not been duly highlighted. The Mohall committee, which were conceptualized by one brave police officer, Suresh Khopde at the time of Bhivandi riots in 1983, have come to stay and are building the bridges amongst the religious communities. During this episode they came forward and did their peace making work with appreciable outcome. It is probably the first time, which showed that if the state-police and social groups are vigilant and aim to control the riot, it can be done, and that too within half an hour. This despite the fact that the underlying bitterness of the memories of 92-93 when the police acted recklessly, and the guilty of 92-93 were not punished in contrast to the accused of 93 March bomb blasts who were punished, and rightly so. This despite the fact the mob which had congregated at Azad Maidan was huge and had been provoked by the section of Urdu, media, the morphed images being circulated and the provocative speeches which should not have been. It is in this context that the need for communal violence Bill becomes all the more urgent, to ensure that police does it job properly, the state leadership acts without prejudices with the sole aim of controlling the violence.